Plans to bring the shutters down on THORP. At a West Cumbria stakeholder working group meeting last week (18th April) Sellafield Ltd outlined plans for the long-term storage of an estimated 5500 tonnes of spent fuel from the UK’s Advanced Gas Cooled Reactor fleet in THORP’s Receipt & Storage pond. The pond, measuring 73m x 23m x 8m deep, became operational in 1988 and the first spent fuel was transferred from the pond for shearing in THORP’s Head End plant for reprocessing in March 1994. As a pre-requisite to the conversion of THORP’s R&S pond to a long-term storage facility in late 2018 when all commercial reprocessing is completed, a ‘change of use’ planning application was submitted to local authority Copeland Borough Council on 28th November last year. The application was in respect not only of THORP’s R&S pond but also its smaller feed pond and the Sellafield site’s Fuel Handling Plant and AGR fuel storage pond – all being key supporting plants for whom current planning consent was based on the original intent to reprocess. A planning decision from Copeland Borough Council is expected in May 2017. In parallel, preparations for a safety and an environmental case for the ‘interim storage of oxide fuels’ are well advanced according to Sellafield Ltd who expect to receive a new Licence Instrument and Discharge Authorisation from the regulators Office for Nuclear Regulation and Environment Agency respectively in March 2018. The specific reference to oxide fuels (rather than AGR fuel) allows for the inclusion of a further 30 tonnes of assorted fuel types including Light Water Reactor (LWR) fuel from overseas, Dounreay PFR fuel and some 17 tonnes of German spent MOX fuel, none of which will be reprocessed. The use of the word ‘interim’ (rather than long term) for the storage safety case appears to pander to the die-hard reprocessing lobby who cherish the hope that, at some point in the future, the need may yet arise for the uranium and plutonium to be recovered from the stored AGR for use as new reactor fuel. The current system for AGR fuel arriving at Sellafield from the power stations is that the fuel assemblies are stored for a period in the Fuel Handling Plant before being dismantled. The stainless steel-clad fuel pins packed in cans for further storage and transferred to the AGR storage pond and subsequently to THORP’s R&S pond prior to reprocessing. Once all AGR fuel contracted for reprocessing has been cleared from these holding facilities, THORP’s R&S pond will undergo two major changes. 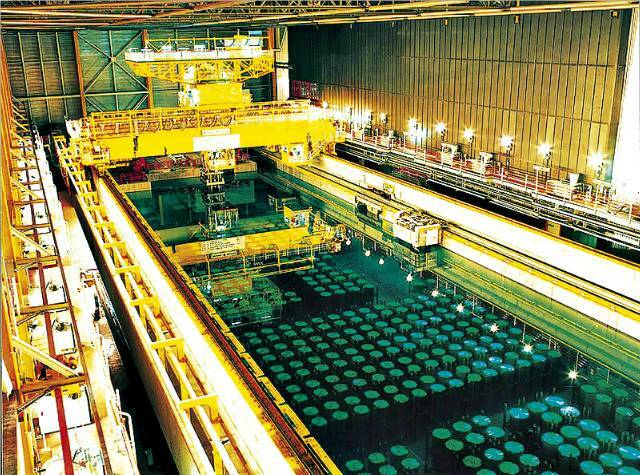 The first is the caustic dosing of the pond water with sodium hydroxide at a pH level (11.4 suggested) that, based on ongoing research, will ensure what Sellafield Ltd estimates to be up to 70 years of corrosion-free pond storage for the stainless steel-clad AGR fuel pins. The dosing will be implemented in November 2018 once the last fuel contracted for reprocessing has been exported from the pond to THORP’s Head End plant. The second change is an increase by around 50% to the current storage capacity of the pond via the use of new storage racks, each of which will hold 63 cans of dismantled AGR fuel pins. 650 such racks are to be manufactured and will provide sufficient storage capacity for the 5500 tonnes of dismantled AGR fuel plus spare capacity to cover for the event that the currently projected operational life all seven of the UK’s fleet of AGR reactors was extended by a further two years. The date of November 2018 is projected for the final shearing of the last batch of spent fuel to be reprocessed in THORP. The event will doubtless be accompanied by the customary eulogy for a plant its developer and original owner British Nuclear Fuels described as its ‘Flagship’ and the ‘Jewel in Sellafield’s Crown’. In reality THORP has failed to ‘do what it says on the tin’ or live up to Government and industry expectations – as the figures show. Designed to reprocess 1200 tonnes of spent fuel each year, THORP is expected to have completed around 9500 tonnes in 25 years of stop/start operation. Allowing for an almost three-year closure in 2005 following the INES Level 3 leak accident, this translates to an underwhelming annual rate of some 420 tonnes. Once reprocessing of the final batch of spent fuel has passed through THORP’s Head End and the Chemical Separation plant, those two facilities will undergo their Post Operative Clean Out (POCO) – a clean out currently scheduled to be completed by the end of 2022.